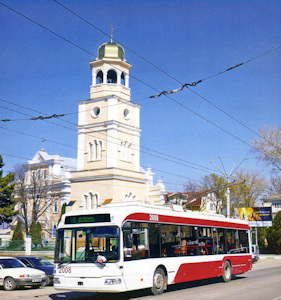 Published six times a year and fully illustrated, "Trolleybus Magazine" is the world's premier journal devoted to trolleybuses. 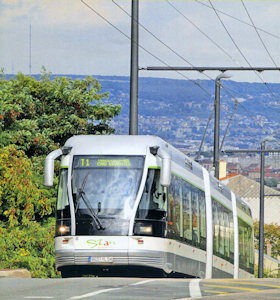 Issues feature descriptions of present-day operations around the world (often with route and wiring maps), new vehicle developments, historical articles, preservation developments, and comprehensive worldwide news. 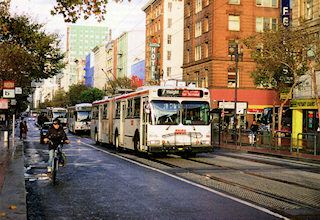 Book and video reviews as well as readers' correspondence are also included. 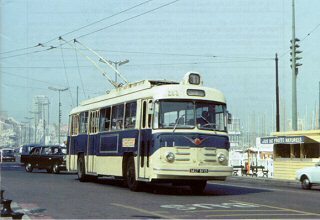 The cover of the latest issue shows Bournemouth 297, a Sunbeam MF2B with Weymann body, on the Christchurch turntable in August 1966. 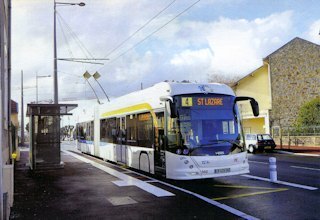 Issue 344 includes Schaffhausen update, Bournemouth-50 years after closure, current Moscow status, Pretoria history part 1, preservation and museum updates, reviews of the latest books and videos, and detailed system news from around the world. 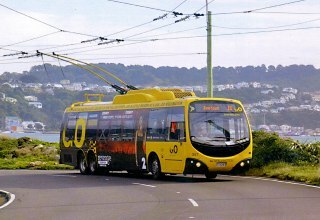 The Editor, Carl Isgar, is always pleased to consider articles and photographs for publication, and can be contacted at 24 Heath Farm Road, Ferndown, Dorset BH22 8JW. 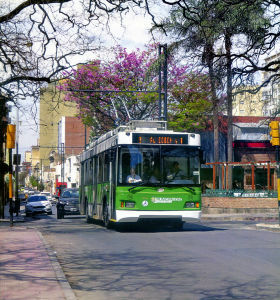 Email editor.tm@btinternet.com. 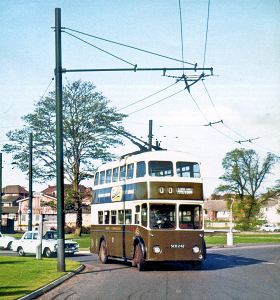 Photographs for publication should be suitably captioned on the back with the name and address of the photographer. 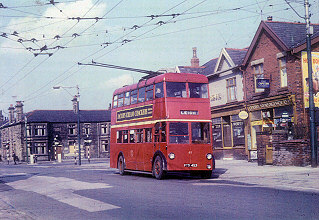 News items [only] can be sent to the News Editor, Peter Haseldine, at The Lodge, Snarebrook House, Woodford Road, London, E18 2UB or via email trolleybus.news@btopenworld.com. 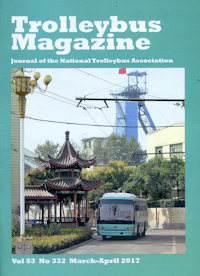 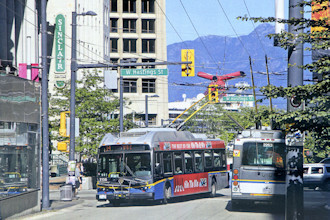 "Trolleybus Magazine" is only available to members of the National Trolleybus Association. 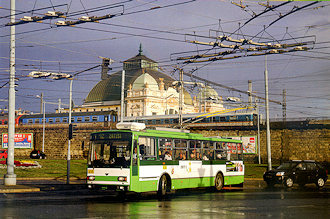 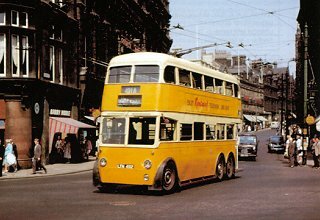 Jihlava 53, a low-floor Skoda 21Tr, leaving the town centre on route C.
Wellington's Designline prototype 301, newly delivered outside Stagecoach's Kilbirnie depot on 10th March 2003.
picture - C. Geaboc Newcastle's 492, turning from Grainger Street into Neville Street, 30th July 1963. 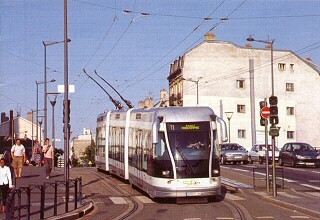 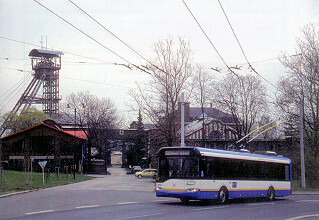 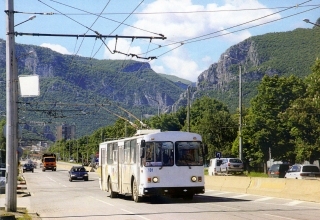 Nancy's guided trolleybus 6, operating without guidance on route T1, approaching the station, 23rd June 2003. 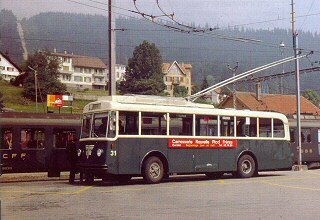 Val-de-Ruz 31, a 1942 Saurer with Ramseier + Jenzer body, at Les Hauts Geneveys station platform, 24th June 1981.
picture - A.G. Murray Lipetsk 035, a BTZ 5276 on new route 4 at Sokol outer terminus. 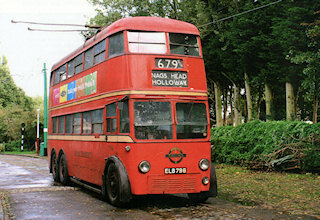 28th July 2003. 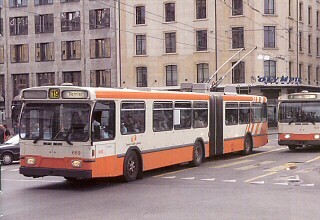 Genève 669, a Hess bodied Saurer GT560, on route 19 crossing Place de Bel Air towards Vernier in July 2003. 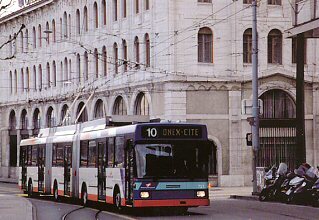 Genève 721, the double articulated prototype Hess, on route 19 at Quai de la Poste in March 2004.
picture - P.Haseldine South Shields 243, a Roe bodied Karrier W of 1945, at Marsden Grotto in May 1961. 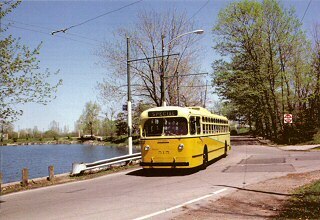 Dayton 515, a 1949 Marmon-Herrington TC-48, repainted in the livery of the City Transit Company, on Lakeside Drive on 25th April 1987 during an enthusiast tour. 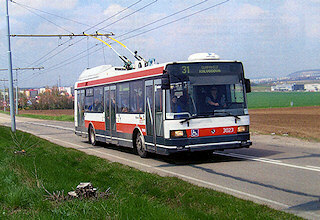 picture - SJ Morgan Arnhem 0228, a 2002 Berkhof AT18, turning at Rijkerswoerd under the 'clothes line' on 27th April 2004.
picture - P.Haseldine Shanghai 663-359, seen in 1984 and built by the undertaking which celebrated its 90th anniversary in November 2004. 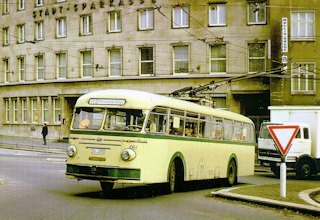 Marseille 293, a Vetra-Berliet ELR, one of 82 purchased between 1955 and 1962 and seen entering Quai de Rive Neuve on 5th September 1975.
picture - J.Priestley Roma 8525, an 18m Solaris, on Via Nomentana and crossing the tramway in Viale Regina Margherita on 27th March 2005, 4 days after the return of trolleybus operation after 33 years. 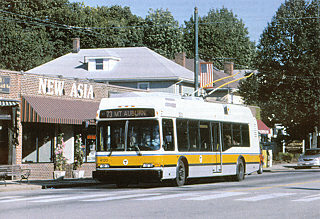 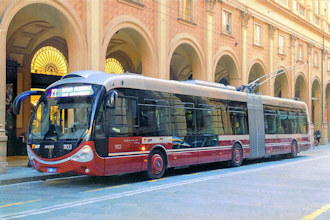 picture - G. Mantovani Boston 4120, one of 28 new Neoplan/�koda vehicles that are the first low-floor trolleybuses in North America. 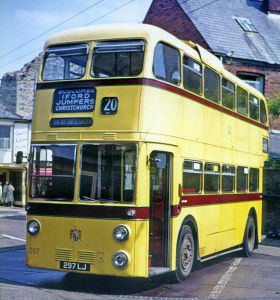 Seen outbound on route 73 in Trapelo Road on 22nd September 2004. 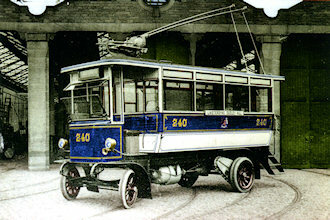 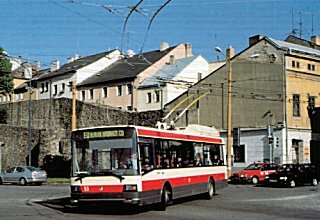 Salzburg 112, built by Gräf & Stift in 1974, appeared on TM's cover to mark the 65th anniversary of the system. 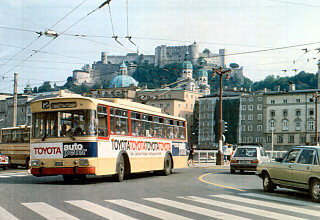 Seen after crossing the Salzach river, with Hohensalzburg fortress behind. 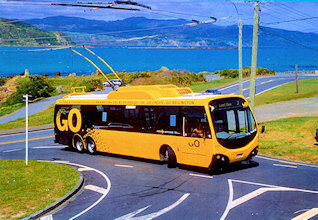 picture - AG. 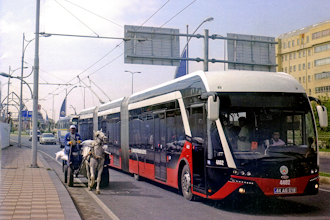 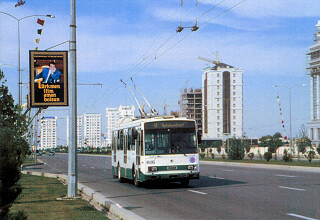 Murray Ashgabat 016, a �koda 14Tr, on May 19th 2005, passing President Niyazov's message to "Let the Turkmen people prosper" on Garassyzlyk, part of the newly equipped trolleybus route 8.
picture - P Haseldine Ostrava 3702, a Solaris Trollino 12AC, on April 20th 2005, passing the town's mining museum on departure from the Michalkovice terminus. 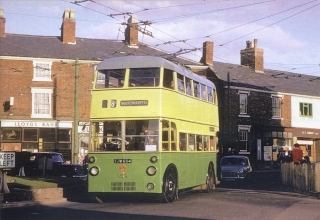 South Lancs 61, a Karrier W utility trolleybus at Four Lane Ends, the limit of the wiring for which Bolton Corporation was responsible. 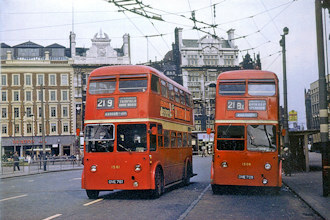 The system closed before the preservation movement got started in the UK. 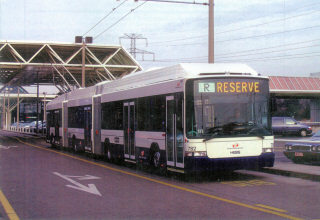 picture - J Batty Double articulated Geneve 782, one of a batch of 10 Hess 'Lightrams' on 14th February 2006 on a test run at the Airport. 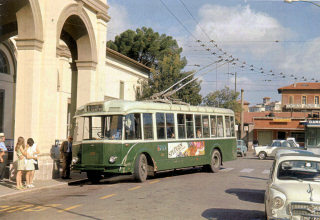 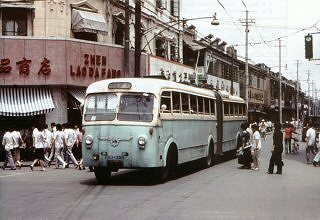 picture - D Pearson Perugia 103, an all-Breda trolleybus delivered in 1949, on 3rd July 1970 at Stazione FS. 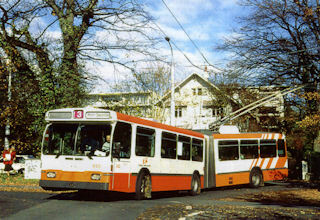 It was withdrawn the following year. 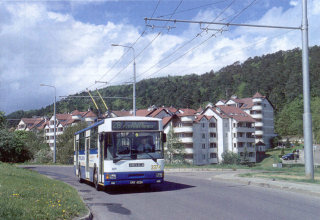 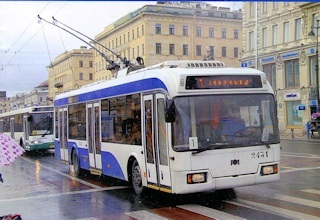 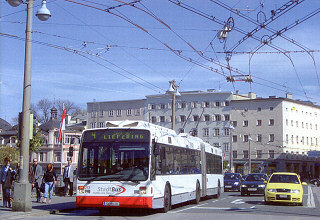 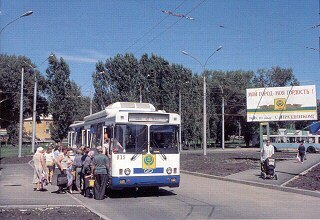 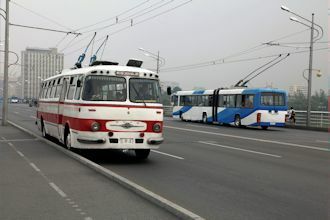 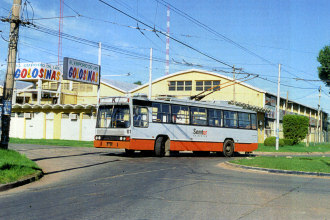 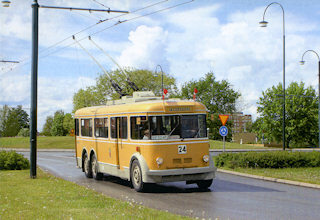 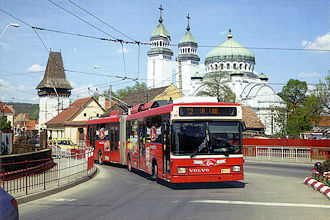 Gdynia 3374, a Jelcz 120MT trolleybus, part of a large batch delivered between 1994 and 2000. 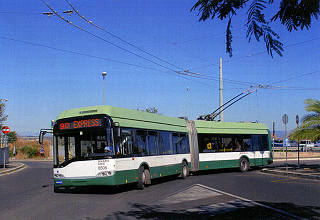 Seen leaving Pustki Cisowskie housing development on 21st May 2006.
picture - P Haseldine Ashton 84 on the 218 service to Piccadilly, circumnavigating the roundabout at Mancunian Way. 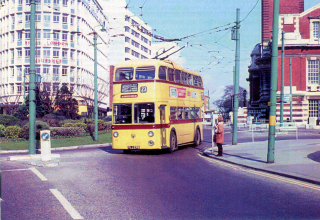 picture - C Isgar Bournemouth 279 correctly showing the red "via Bath Road" auxilliary blind display. 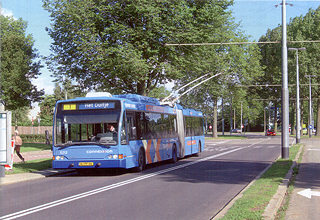 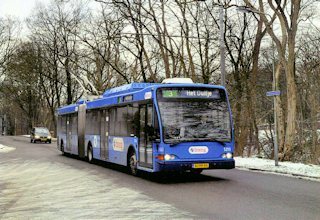 Arnhem 0212, a Berkhof Premier AT18 with Kiepe electrical equipment and Berkhof body, at Emmersingel on route 1 towards Het Duifje in January 2002.
picture - CF Isgar Athens 9035, an articulated Neoplan N6221 with Kiepe electrical equipment, at Nosokomeio Evangalismos on route 13, 8th June 2006.
picture - V Thrun Salzburg 272, a Van Hool AG 300T, delivered in 2003, at Staatsbrücke on route 4 to Liefering, on 7th April 2007. 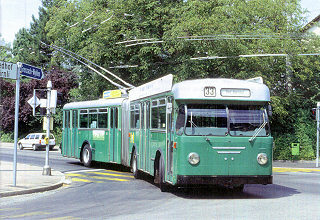 Basel 902, a FBW/SWP/FHS/BBC/SAAS consortium trolley, built in 1968, turning right from Bäumlihofstrasse into Rauracherstrasse on 28th July 1992.
picture - CF Isgar Solingen 40, a Henschel/Uerdingen ÜH111s trolley, now liveried as Salzburg 123, beside sister vehicle 59, on 23rd June 2007.
picture - G Mackinger London Q1 class 1812, flanked by L3 class 1521 and K2 class 1201 in September 2007 at the East Anglian Museum - the first time 1812 had run alongside other London trolleybuses since 1974. 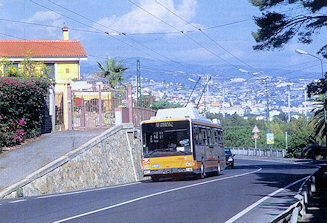 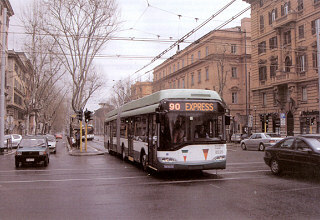 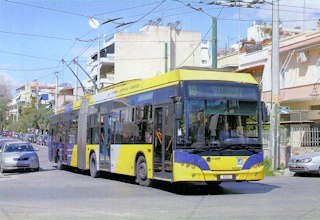 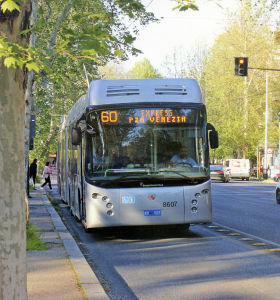 Roma Solaris 18T 8505, turning into Viale Rosetta Pampanini, on departure from Largo Labia terminus, on the edge of Roma's built-up area. 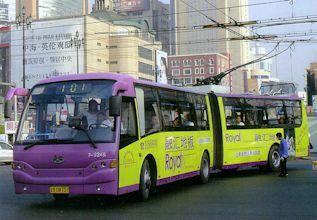 picture - SJ Morgan Qingdao (China) D-5-909, a SK 5105 GP trolleybus built by Shanghai Coach in 1997/8, seen operating on route 5 between Qingdao Railway Station and Victory Bridge, in August 2007.
picture - M Thrun Rosario Volvo B58/Marcopolo/Powertronics no.1 operating at the western end of route K; a system not pictured by TM for over a decade. 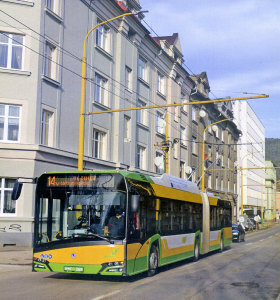 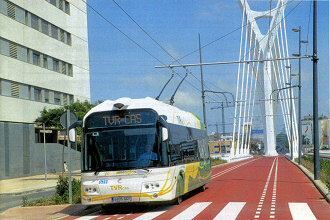 Castell�n Irisbus Cristalis no.146 after crossing the striking new bridge linking Paseo Universad and Paseo Morella on 23rd May 2008.
picture - P Haseldine Gen�ve 652, a Saurer of 1982 at the the Petit-Saconnex terminus of route 3 in November 2003.
picture - A Belton Napoli ANM F9110, an AnsaldoBreda F19 on the system's newest route, the 202, about to turn from the northern end of Piazza Gianbattista Vico on 28th September 2007. 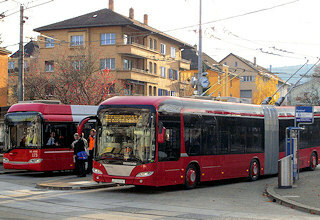 A Neoplan Electroliner for Barquisimeto beside Winterthur 173, a Solaris Trollino 18T at Farbhof turning circle in Zürich, during the Trolleymotion conference on 19th November 2008.
picture - A Bruce San Remo's Siccar F1154/Breda trolleybus 1712 climbing out of San Remo twards Capo Pino on the long interurban route V to Ventimiglia. 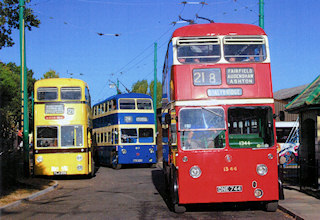 picture - MJ Russell Edmonton's centenary celebrations on 17th September 2008 at the Stadium Station terminus with 1954 CCF-Brill 202 beside 1982 BBC 180. 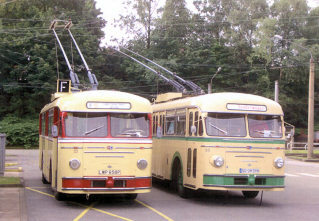 Arnhem 101, a BUT 9721T with a Verheul body, delivered in 1949 for the opening of the system. 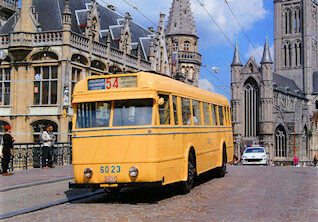 Acquired in 1972 for preservation and restored in 1983/4, 101 appeared for the 60th anniversary celebrations in 2009.
picture - P van Onzen Bruxelles 6023, a 1956 Brossel with a STIB body, during the closure of the Ghent system on 14th June 2009, on perhaps it's last outing on a Belgian street equipped with overhead wiring. 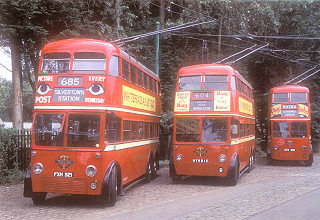 picture - CF Isgar Manchester 1344, followed by newly re-launched Ashton 87 and repainted Bournemouth 286 at the EATM Trolleybus weekend of 12th and 13th September 2009. 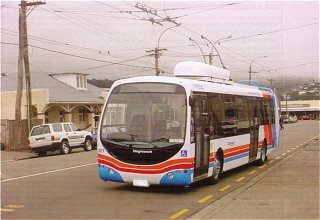 Wellington 338, a Designline 3 axle trolleybus at the Lyall Bay terminus of line 3 on 28th October 2009.
picture - MJ Russell San Francisco 7045, a New Flyer dating from 1994 heading along Market Street on recently closed route 7 on 19th October 2009.
picture - A Murray The first of 45 BredaMenarini articulated trolleybuses for Roma, in Plzen where it has been fitted with electrical equipment by Skoda. 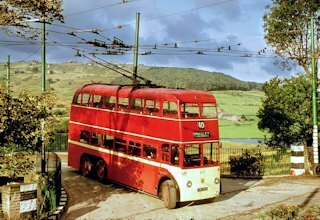 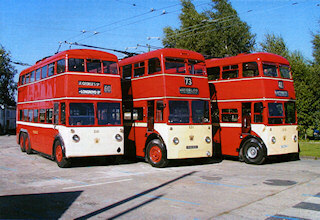 All of Sandtoft Museums' Huddersfield trolleybuses, 541, a Karrier MS2 of 1947, 631, a Sunbeam S7 of 1959 and 619, a BUT9641T of 1956.
picture - B Lake Brno 3023, a Skoda 21Tr, on the interurban route to Slapanice on 23rd April 2010.
picture - D Lawrence London 796, a class H1 Leyland LPTB70, at Carlton Colville on 6th October 2010 after arriving from France. 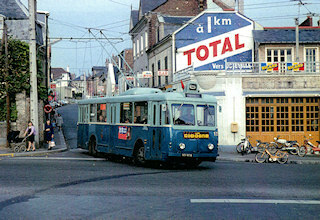 Le Havre 13, a Vetra VBRh, at Rue de Bayonvilliers on 31st October 1970.
picture - MJ Russell Bradford 240, a Railless car, at Thornbury depot in June, 1911, that pioneered trolleybus operation in the UK. 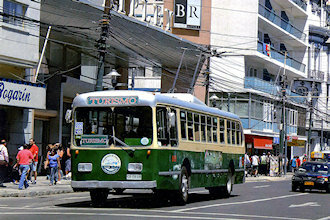 picture - TMC Collection Valparaiso 888, a 1948 Pullman-Standard, with rebuilt front end dating from 1988-89, on the 'Turismo' city service in January 2011. 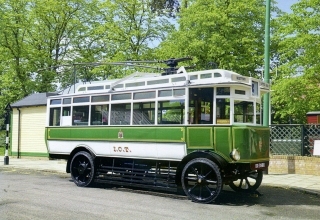 Kopenhaven KS101, a 1938 Leyland/KS/GEC, preserved at the Danish Tramway Museum, visiting the Landskona Trolleybus Festival seen at Ferry Terminal on 15th May 2011.
picture - D Pearson Newcastle 501, a 1948 Sunbeam S7/Northern/MV, owned by Beamish Open Air Museum, visiting Sandtoft on August 28th 2010.
picture - A Bruce Aqtobe 80, a BTZ-5276.04, operating in October 2011. 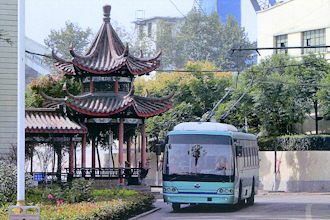 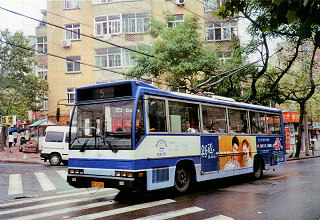 Dalian 7-2345, a CJWG150 built by Hangzhou Changjiang Coach plant in 2005/6, operating in August 2008 on the sole route 101 at Shengu Square. 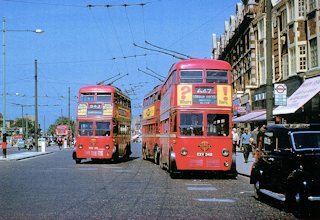 picture - A Whitlam London 1201 overtaking 1348 on Stamford Hill. 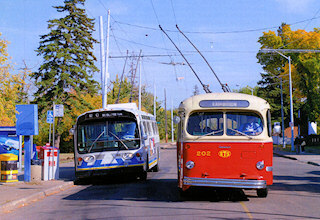 Fifty years later and both vehicles are preserved in running order. 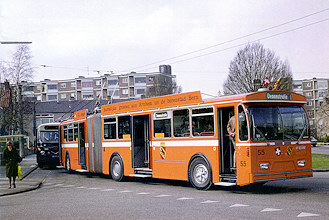 picture - D Thompson Solingen 051, a first generation UH111/s of 1958 at Schlagbaum bound for Ohligs on 22nd October 1973. 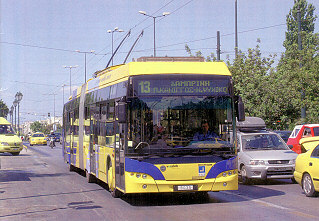 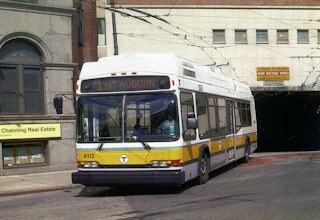 Boston 4112, a Neoplan/Skoda delivered in 2004 leaving the Harvard Tunnel on rute 73 on 24th April 2012.
picture - RJ Buckley St Petersburg 2431, a BKM 321 delivered in 2008 seen in Nevskiy Prospect on 11th August 2011.
picture - A Brown Huddersfield 632, a Sunbeam S7A with East Lancs body and Metropolitan Vickers electrical equipment delivered in 1959, leaving the Longwood reverser on 19th September 1965. 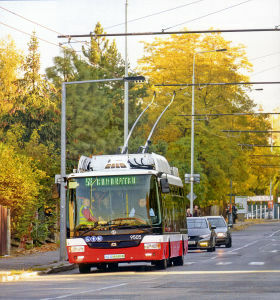 Arnhem 5213, a Berkhof trolleybus operating on the rerouted line 3 under new wiring at Cattepoelseweg on December 13th. 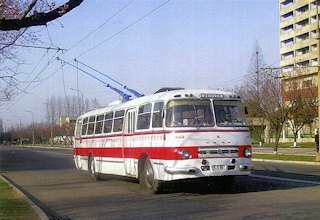 picture - P van Onzen Pyongyang 118, a rarely seen Chonline-72 trolleybus, built around 1973, on 17th April 2013.
picture - N Bennett Limoges Hess Swisstrolley4 902 just after re-poling on Avenue du Parc on April 12th 2013. 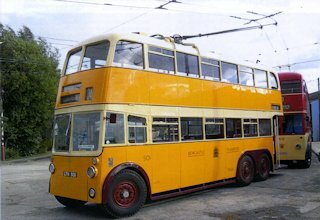 Athina 9051, a Neoplan N6221 on line 10 at Odos Isminis terminus, 26th April 2013.
picture - D Pearson Wolverhampton 654, the last Guy trolleybus built, seen at Sedgley on 5th March 1967, the last day of operation. 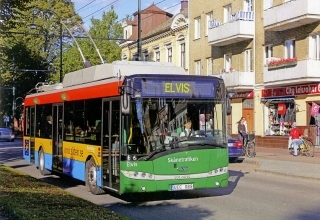 picture - D Pearson Landskrona 6994, named Elvis, a Solaris Trollino 12, seen returning to Kasernplan September 27th 2013. 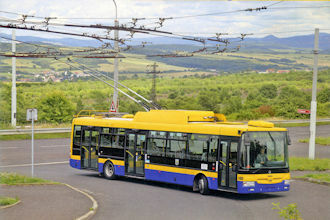 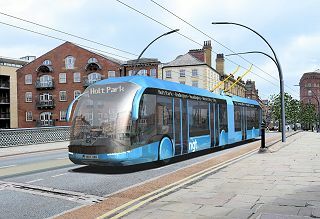 Wellington 357, a three axle Designline with Electra equipment, seen on Cobham Road, Wellington Airport, 29th April 2013.
picture - C Isgar An artists impression of a Leeds articulated trolleybus on Leeds Bridge as it may appear in 2019.
picture - Metro Ipswich 2, a 1923 Railless with Shorts body at East Anglia Transport Museum, 10th May, 2014. 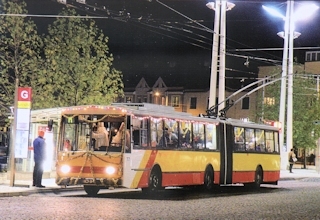 Vratsa 101, a ZIU-682V1A on Mito Orozov heading north on route 17 on 19th May 2014.
picture - MJ Russell Hradec Kralove 77, a Skoda 15tr 02/6 decorated for St Nicolas celebrations at the main railway station in December 2013.
picture - D Ditrych Pyongyang 184, a Cholima-70 with 396, a Cholima-091, heading out of the city on Okryu Bridge in August 2014. 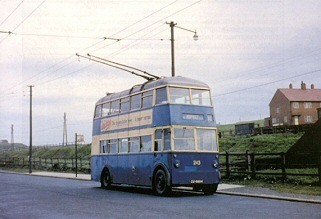 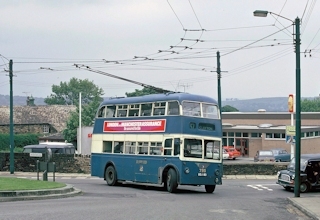 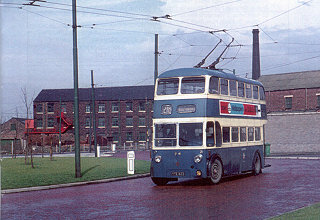 Bradford 795, a BUT 9611T with an East Lancs body, built in 1951 for St. Helens, at Clayton Town End Terminus. 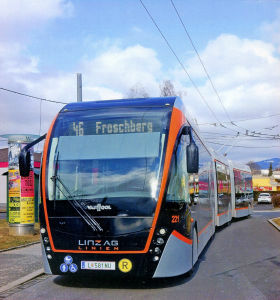 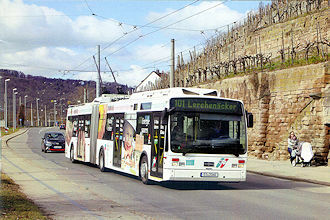 picture - P.Hanson Esslingen 213, one of eight Van Hool AG300T trolleys of 2002, seen on Mettinger Strasse, 5th March 2015. 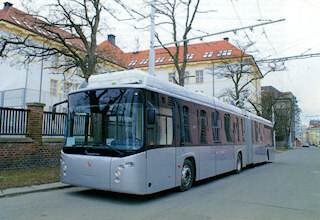 Medias 80, the prototype Hess Swisstrolley1, built on a Volvo chassis in 1991, seen entering Starada Herman Oberth on 27th April 2015. 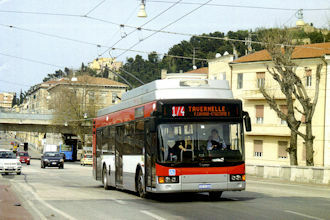 Ancona 015, an AnsaldoBreda F22 (ex-Nancy) on Guglielmo Marconi, 14th April 2015. 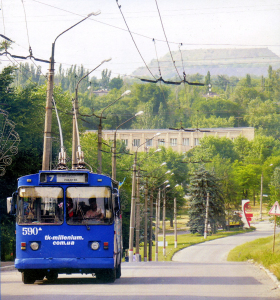 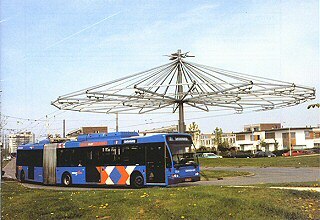 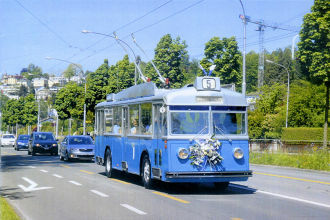 The National Trolleybus Association © 2006-16. 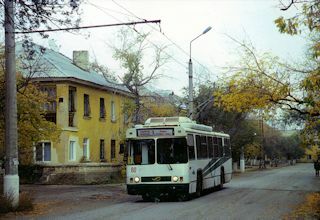 Photographs are copyright of their respective owners. 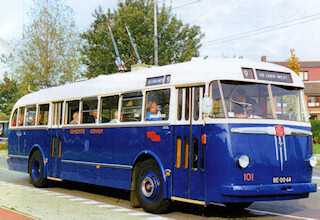 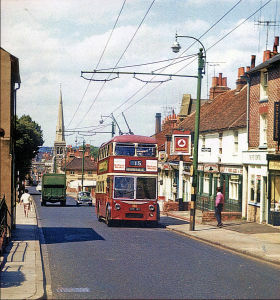 197	Bournemouth - 2, Polish trolleybuses for Russia? 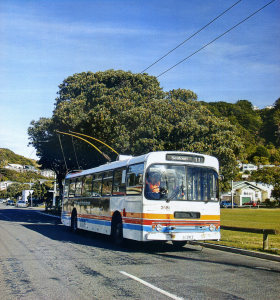 Most back issues are available for sale.